Just hours after Juventus' amazing 3-0 win against Atletico Madrid, Ronaldo's former team-mate and BT Sport Pundit Rio Ferdinand has described the Portuguese star as, "A living football god." Juventus were trailing in their Champions League Round of 16 tie against Atletico Madrid after the Spanish team won the first leg 2-0 at the Wanda Metropolitano. Juventus needed at least 3 goals last night, which the Italian champions managed with their star-studded squad, or should we just say, their new signing and probably the best player in the world, Cristiano Ronaldo. Rio Ferdinand heaped praise on the Portuguese footballing icon came after his hat-trick in yesterday's match. It was always a difficult game for both sides but Ronaldo made the difference on the night with a stunning display. Ronaldo opened the scoring in the 27th minute with a header into the back of the net, after successfully winning the aerial dual on the far post against Atletico's veteran defender Juanfran. He then went on to add to his tally in the 48th minute, just after the second half began, when he headed the ball into the Atletico goal, just for keeper Jan Oblak to clear it off after the ball had crossed the goal line. The goal-line technology enabled the referee to immediately declare Cristiano's header as a valid goal. Ronaldo capped off his hat-trick and Juventus' successful comeback with a penalty in the 86th minute. Speaking on BT Sport after the game, Ferdinand couldn't help but gush over the 34-year-old's performance. "He is a living football god, it is ridiculous what he is doing," Ferdinand said. "In the Champions League, he has every record you could imagine. He's the joint-hat-trick man with Messi. 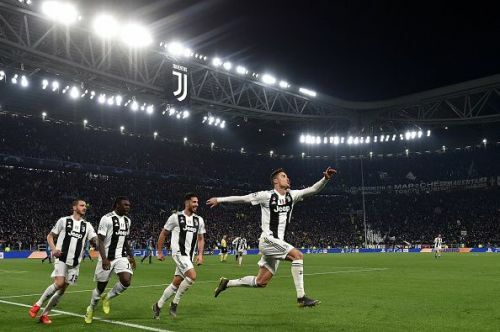 Juventus joined Ajax, Manchester United, Manchester City, FC Porto, and Tottenham in the quarterfinals of the Champions League, while FC Barcelona, Lyon, Bayern Munich, and Liverpool fight it out tonight for the two spots remaining.